When most people who’ve been blessed enough to drive Formula One cars get out of their first ride, the immediate thing they note is the massive power of the carbon brakes. In the middle of a race, F1 drivers can expect to experience up to 5G under braking. This is how Brembo tests those brakes. 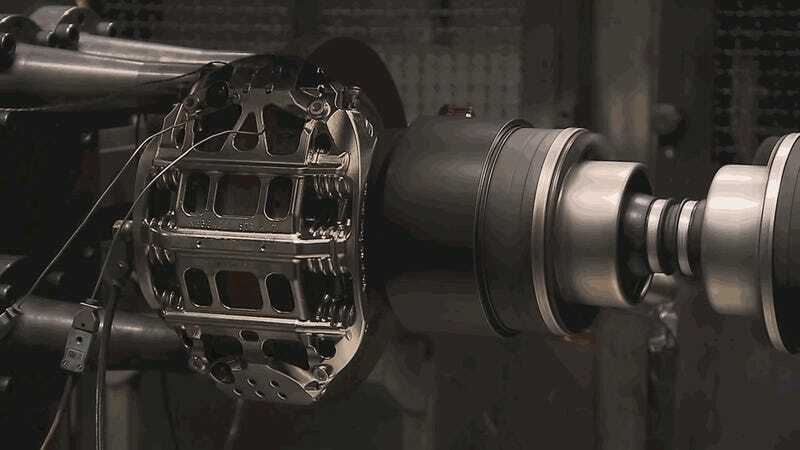 Since these brakes are expected to stop a car weighing over 1,500 pounds from speeds over 200 MPH, repeatedly, for nearly a full day, without failing, they’ve got to undergo some pretty rigorous testing. That includes spinning them up to incredible speeds, and then repeatedly clamping down on them until they glow red hot, at temperatures over 1,800 degrees Fahrenheit. I want one of these. Just one of these. Throw it on a Mark II Golf or something. Yeah. That’d be real nice.